We’re excited to announce that the awesome Ben Tesh will be hosting a pop-up restaurant at Church St on Saturday 28th May! Ben has trained at some of the UK’s best Michelin starred restaurants. 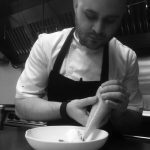 He began his career at Winteringham Fields with Colin McGurran, before his move to Anthony’s Restaurant in Leeds, where he worked his way to the position of Head Chef. 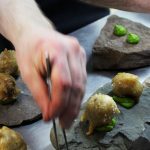 He followed his time in Leeds with stints in some of London’s finest kitchens and spent a short time working in Denmark under Rene Redzepi at former best restaurant in the world, Noma. Upon his return to the UK he worked with Alex Bond at 1* Turner’s restaurant. Ben has also spent time furthering his culinary knowledge, working for free in renowned restaurants such as 1* Hedone, London and 2* L’enclume, Cartmel.